Hey folks! 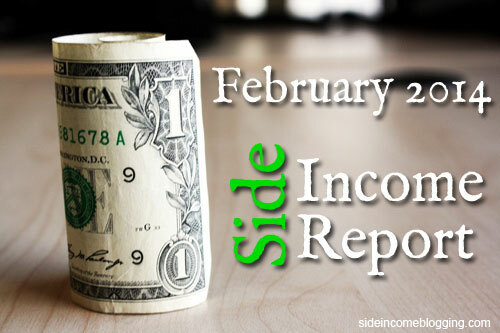 Well past time for another Side Income Report and February of 2014 is due. February was actually a pretty decent month for earnings, with my niche site and blogging income increasing over January, and my services income decreasing. This is a trend I would like to continue to see, as I work to get my passive income higher, and continue to focus less and less on my services work. Unfortunately February and March income numbers were and are effected by a car accident my wife and I were in on February 15th. We were coming home from dinner, down a four hour lane highway. We were in the right lane, and another car was traveling in the left hand lane, a little ahead of us. The driver unfortunately decided to make a very sudden right hand turn from the left lane, directly in front of me. I T-boned them in the right side, and in the process caused $6000.00 damages to my car, along with breaking my thumb, elbow and a fracturing a few knuckles. I also had some severe bruising to my collar bone and rib cage due to the seatbelt. My wife had some soreness, but no major injuries. As I type this, I will have 1 more week to go in the cast. While typing and working online is still a bit difficult, for a good 2 weeks after the accident it was near impossible due to the swelling and bruising of my left hand. Couple that with being busy with paperwork, getting a rental car, scheduling to get my car fixed, medical visits, etc and the last half of February and early parts of March weren’t near as productive as they normally would be. This had a negative impact on my income. BUT, with that said, my wife and I feel very fortunate the injuries were minor. The accident and impact of it could have been far far worse. On a good note, the migration of my sites to A Small Orange hosting has turned out to be great decision. Their hosting is fast and reliable, and to be really honest I seldom even login to my hosting account. I don’t even worry about hosting much now, and am able to primarily focus on writing content and improving user experience on my sites. If you’re considering switching hosting companies, I just can’t recommend A Small Orange enough. Inexpensive, fast, reliable and they provide great support. Adsense for February was down by about $10 from January. This is directly attributed to me not being to work as effectively during the second half of February. My Adsense income is directly proportional to how often I post and update my Facebook pages. Amazon affiliate income was up for February and I hope this is the beginning of a trend you’ll see throughout the remainder of the year. My Amazon based niche sites continue to trend upward for income and traffic. I’m finally ranking in the top 10 for a few keywords that have a good conversion rate for Amazon purchases. This is still far short of my $1000.00 per month goal. I need to work on that.